The New Year is the time to make resolutions. The problem is that many people dismiss such resolutions as good intentions that are almost made to be broken. In the rush of things, no one has time to keep them. I disagree with such conclusions. My book, Return to Order: From a Frenzied Economy to an Organic Christian Society—Where We’ve Been, How We Got Here and Where We Need to Go, is all about resolutions that need to be made. In fact, the book itself is the fruit of a New Year’s resolution. For a long time, I had struggled to find the time to study and write the book. On January 1, 2008, I resolved to study every day even if it be for fifteen minutes. Now, eight years and one book later, I still have the habit of studying and writing every day for one, two or even five hours. Resolutions can work, if we only let them. Moreover, we need them if we are to return to order. But resolutions must be good resolutions, not fleeting whims. I maintain there are three secrets for making good resolutions. The first is to choose a task that is very concrete and specific, like studying a particular topic. Second, it must be doable — if only for fifteen minutes. Finally, it must be done consistently — every day if possible. In the keeping of resolutions, we must remember that it is better to do a lot of a little than a little of a lot. I believe the book, Return to Order, has some very important principles around which good resolutions can be made. 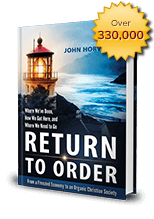 Thus, based on the book and these three secrets, I would like to suggest five “Return to Order” New Year’s resolutions that anyone can do for 2016 to improve their own lives and contribute to America’s return to order. 1. The first resolution would be focused on the concept of frenetic intemperance. This term refers to the modern habit of living frenzied lifestyles and a demand for instant gratification. Each person should ask: How might I reduce frenetic intemperance inside my life? One concrete resolution might be to turn off your gadgets for a specific amount of time each day — even if it only be for fifteen minutes. There are, for example, programs that allow you to disable the Internet at set times on your gadget. Set some times when you deny yourself access. You will be amazed at how liberating the experience can be. 2. A second resolution could deal with adopting a more organic approach to life’s problems. It is one thing to disconnect from the frenzied pace of our lives, and yet another to connect with those natural situations where we ponder over the things that give our lives meaning. One concrete resolution would be to set aside time to study, read, walk, converse or pray — again if only for fifteen minutes. When you develop habits like these, it has the effect of putting life in order. 3. A third resolution would be to find ways to seek after sublime things. Sublime things are those that by their excellence cause us to be overawed by their magnificence, grandeur and marvelousness. This can be done by developing skills of appreciation for the truly awe-inspiring things in life. One concrete resolution would be to take some time each day — even if it be only fifteen minutes — to develop an artistic skill like playing an instrument, painting pictures, writing or even cooking. Such a resolution will help you expand your horizons and look beyond yourself. 4. The fourth resolution focuses on what the book, Return to Order, refers to as the dream. By “dream,” we mean the process by which we idealize our goals in our lives and in society. To dream means to imagine how things might become better, more beautiful or more sublime. A concrete resolution might be to take something in your life — a room, a skill, a project or a garden — and imagine ways of improving it. Throughout the years, spend time putting those plans into action. Such imagining has always been the basis of culture. 5. Finally, the fifth resolution involves embracing the Cross of Christ. This means accepting the fact that life is full of crosses and our attitude must not be one of resentment towards life’s misfortunes, but that of acceptance and resignation. A concrete resolution would involve developing habits of prayer and supplication in face of major suffering. This might include, for example, making visits to the Blessed Sacrament or practicing a devotion that works for you in times of trial — even if it be only for fifteen minutes. The important part of this resolution is to develop an attitude toward the cross that puts your soul in order. 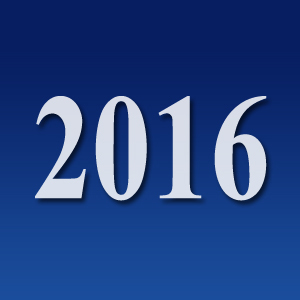 There are many other “Return to Order” resolutions that could be made for 2016. The important thing is to take universal principles and apply them to the concrete circumstances of our lives. Perhaps that is the problem with modern resolutions: they are empty words or set formulas that are not adapted to the circumstances. They are ephemeral moments of good intention lost amid our frenzied comings and goings. That is why real resolutions are so needed to put order back into our lives. One simple way to do this is to take to heart three secrets for making good resolutions and adapting five sample resolutions according to your circumstances. Resolutions work — if we let them. This entry was posted in Featured and tagged America, Catholic Church, Christian civilization, Christian principles, Family, frenetic intemperance, Natural Law, Order, organic Christian society, Return to Order by RTO.org. Bookmark the permalink.